When the original email came from John Marks of John Marks Records through our fearless publisher inquiring as to my interest in looking at an outboard "sonic enhancement" black box, the last thing I thought I would ever find myself doing would be recommending such a device. (Jeez, Greg, maybe you could use some lessons in the use of foreshadowing.) Why me? Probably because the whole concept of an add-on gizmo, plus its necessary additional set of interconnects, to increase fidelity goes against all my years of experience and audio logic. Looking at it from a purists point of view, the fewest devices (and signal paths) in a chain should provide the highest degree of fidelity, right? Well, the more John went on about the device, the more he piqued my curiosity. The bait was taken, the gizmo shipped, and the game, as they say, was afoot. The Source Components Electronics Harmonic Recovery System is an analog interface that installs between your preamp and power amp (or between a CD/laser player and its preamplifier input) via single-ended interconnects. Its purpose is to restore body, uncover inner detail, lower the noise floor and improve imaging. You put your signal in and the HRS delivers a newly created outbound signal which is said to offer superior signal-to-noise performance and enriched subtlety of detail and harmonic structure, and be more "amplifier friendly." According to John Marks, the HRS processor uses HEXFETS and JFETS in a novel way, leaving the designers torn between going for a patent or just potting the whole thing and keeping it a secret. One thing for sure, it joins a growing string of like devices such as the TDSII (reviewed here last year) and the newer TDS - Passive. Housed in a box the size of your typical preamplifier, the HRS is a case study in simplicity. The front of the device sports only two (count em, two) distractions to its attractive brushed black faceplate: a gold stylized company logo, which is set just above a green pilot light. The back is just as elementary, with only the input and output RCA jacks to the right side and an IEC power-cord socket and an on/off switch to the left. A look inside revealed that the HRS is fitted with a very solid power supply and populated with some proprietary components. The use of premium, limited-production capacitors, high-grade epoxy circuit board and 24K gold-plated cast-copper RCA jacks round out a fine pedigree. In a nutshell, the device is a class-A, solid-state gain stage that boosts the signal it is given by roughly 3dB (the specification sheet reads 2.7dB). Increasing the gain has the effect of lowering the noise floor and providing a more suitable signal for driving the input stage of a power amp. Additionally, it offers a nice high input impedance for those high-output-impedance preamps to be happy with and a nice low output impedance which will drive just about any amp quite well. Much of HRS's performance has to do with the dynamics of signal transfer. Simply feeding an amplifier a "clean" signal does not necessarily provide the drive required by the input stage to yield its best sonics. The poor sonics occasionally realized when a quality digital front-end is fed directly to a power amplifier best exemplify this. 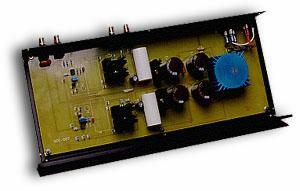 The HRS helps to create a better transfer function to the amplifier. The amp is now free to work more easily at the input level and is therefore able to deliver better dynamic contrasts, inner detail and soundstaging. And you know what? It seems to work. The price? $399! When the HRS arrived, I was literally on my way out the door for a ten-day jaunt into the great American Midwest on a quest for vinyl. Immediately upon my return I unboxed the HRS and hooked it up for run in. You simply install between your preamp (or CD/LD/DVD player) and power amp (or receiver/home-theater processor) and wait for the magic to begin. Level matching for "in" and "out" comparison testing wasnt too difficult. The HRS provides roughly 3dB of gain, and my Threshold FET nine/e preamp permits change by 1.5dB increments with its stepped attenuator. Now, while a quarter of a decibel is not totally insignificant, it can be considered negligible to the results of my listening tests. Over the next couple of days, as the unit progressively began to strut its stuff, my opinion changed drastically as to the usefulness of an add-on enhancement device. Right out of the box, the HRS seemed to have absolutely no effect at all on the sound, good or bad. Now, that isnt necessarily a bad thing when you think about it. When engaged, this device contributed no degradation to the music coursing through it. It had no sonic impact at all. Then slowly it began to gently massage the music, so slightly at first that I wasnt consistently able to be sure it was doing the same thing from tune to tune. Then at about day six something magical and consistent began to happen. This development was subtle, yet emotionalI started to believe in the magic. Here is what I heard. Stage and image  The HRS provided a "sharper," more focused view into the stage. Sounds displayed much more stable and solid images both emanating from smaller, more concise points in space yet seeming larger in that space than before. On an even more exhilarating note, it widened the very rear of the stage, which most often tends to narrow as it retreats. This typical stage sort of loosely resembles a triangle, with its base between the speakers and its apex somewhere behind the back wall. It again contributed more focus and clarity to the newly widened rear of the stage. It noticeably extended the depth the soundstage on every recording I auditioned. Its effect on the layering of individual instruments within the stage was anything but subtle. It imparted the digital soundscape with a greater degree of the more rounded and three-dimensional layered presentation I normally have come to expect only from vinyl. And with LPs, even more of this already good stuff. Timbre  Voicesbe they brass, bronze, gut, reed, human, et al.were portrayed in a manner thats closer to sonic truth. They also seem a bit more liquid and vibrant. They were presented with more "breath," sounding more like the voice of a real instrument played in space. Dynamics  Transients were faster, both enriching the overall harmonics and adding another degree of deftness to the overall truthfulness of the presentation. Focus and clarity  Details were more clearly emphasized. Subtle noises become recognizable sounds and were more readily apparent. Things that previously tended to be confused or masked down towards the noise floor possessed more detail. The entire rendering, front to back, left to right, and top to bottom, was brought into better focus, as if suddenly viewed through a sharper lens. Bass  Well, that has varied widely, from no apparent change to a distinct addition of weight and resolution. But the bass seems considerably more recording specific than the other characteristics. Although the TDS II reviewed here on the Stage! last year had some of these attributes, it also had enough detrimental effects on the signal, including destruction of fine detail and slurring of rhythm, to prevent it from receiving an unqualified recommendation. Try as I might, I couldnt uncover even the tinniest of blemishes in the HRS, let alone a major shortcoming. It adds a level of vibrancy and substance to the music that is completely intoxicating. While I may have used some sweeping terminology in my descriptions in order to more clearly and effectively describe the effects of this device, I want to make it clear that, though the individual improvements taken separately were subtle, the final sonic alchemy was not. Considering the means by which the HRS achieves its result, its performance will likely deviate widely from system to system. In the words of John Marks, "Your actual mileage may vary." While this device may not afford the same degree of enhancement in every system, I am compelled to add my voice to that of Mr. Marks when he exclaims that this is a "must hear" component. The Source Component Electronic Harmonic Recovery System would seem to be a perfect choice for someone running a passive preamplifier or a digital source directly to the amplifier. And given my experiences, even someone with a fully realized system may well experience a complete transfiguration with the addition of the HRS. The difference the HRS afforded me was akin to that of adding, say, just the slightest squeeze of fresh lemon to an otherwise flawlessly prepared baked trout entrée. In my system, in its current configuration, the HRS is utterly indispensable to realistic, truthful music-making. Newsflash  This just in as I finish this impression. John Sollecito of Source Component Electronics has just informed me that there is a second generation of the HRS available. Ironically, I am told that the only changes are slightly cleaner circuit-board tracing, an IEC receptacle mounted directly to the board, and no power switch, all of which could add up to significant improvement. Stay tuned for a follow-up. This new HRS is on its way.